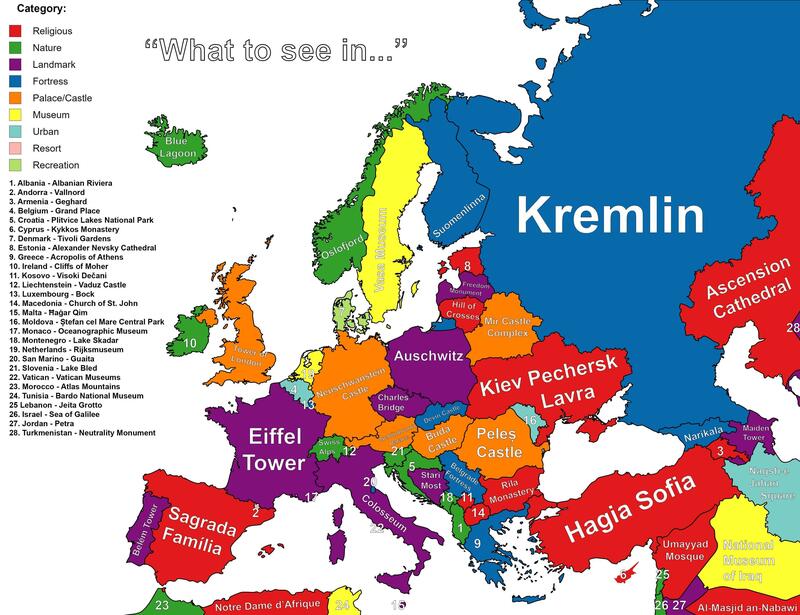 The map above shows the top tourist attraction based on the autocompleted Google answer to the question “What to see in…?” each of the European (ad surrounding) countries above. Just keep in mind Google alters its results based on user location, so if you do a similar search you may see slightly different results. Luxembourg should be the “Casemates du Bock”. You ignor AUSTRIA! This is a big mistake! You have no education in history! SORRY MY MISTAKE I SEE NOW SCHLOSS SCHÖNBRUNN! Netherlands : there are a lot of Rijksmuseums in different cities , so which city? Another map that subsumes the four nations of the UK into one, giving an English answer. What about Edinburgh Castle? Poor show. You could not say preferably that this country is best or that country is best to visit every country has a unique thing to see every country has a different history I might visit most of them but would not say that some is best and others are not thanks for the wonderful post and thanks for the list.